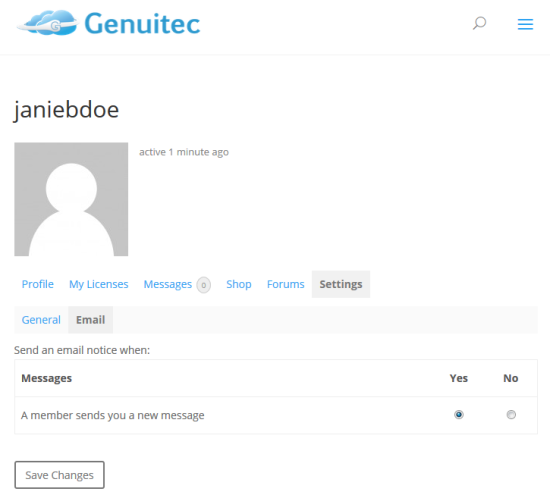 After registering with Genuitec, access your profile to manage your profile preferences, licenses and forums. You can also message members and make purchases. 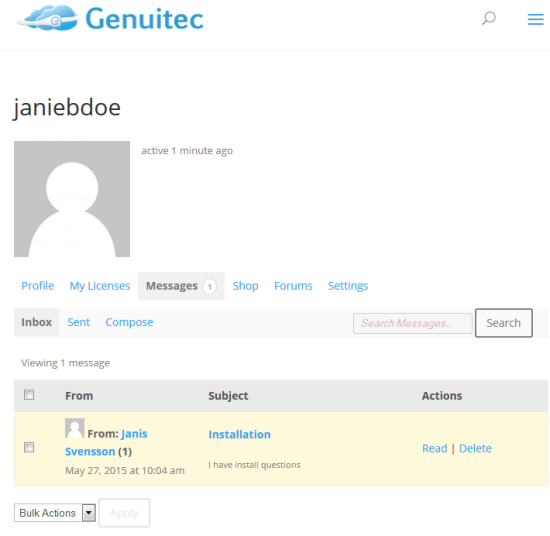 Go to https://www.genuitec.com/member-home/. If your are not logged in, enter your Username and Password when prompted. Tip: While logged in, you can select My Profile from the menu bar to quickly view your profile. Update your profile settings when you want to add a profile picture, change the email associated with your account, change your password or select your preferences for receiving email notifications when a member sends you a message. Your profile picture is updated by your Gravatar (Globally Recognized Avatar) image. Gravatar is a free service that allows you to create a single profile that is used on any Gravatar-enabled site. Click Sign In at the top-right corner of your browser window. 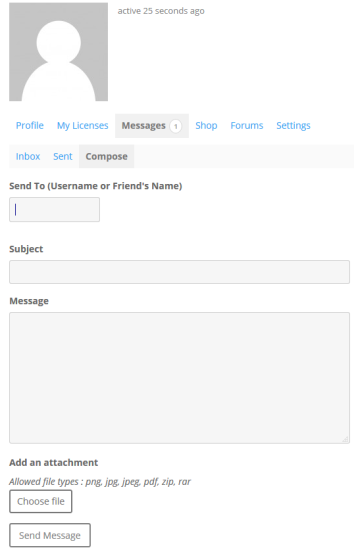 If you have a WordPress.com account, enter the email or username. Note: If you do not have a WordPress.com account, click Create an Account and enter the required information. You will receive an email from WordPress.com to activate the account. After you activate the account, you will be able to set up your Gravatar. Click Add an Image to select an image to use as your profile picture. 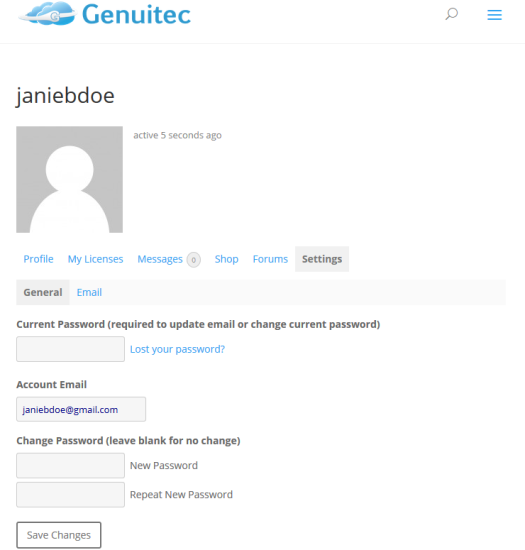 The image will automatically appear in your member profile the next time you log in to Genuitec.com. View your profile and select Settings>General. Enter a new email address in the Account Email field. Enter the new password again in the Repeat New Password field. View your profile and select Settings>Email. Select your messages preference. If you select Yes you will receive an email when you receive a message from a member. Your profile includes a list of all product licenses associated with your account and allows you to upgrade your products, renew licenses and request license keys. You can also associate other subscriber’s license keys with your account. To renew a license, click Renew. Note: This options is only available when a product is expiring within 45 days. To upgrade to a new level of your product, click Upgrade. To receive an email with the Subscriber ID and Subscription code for the product, click Resend Key. 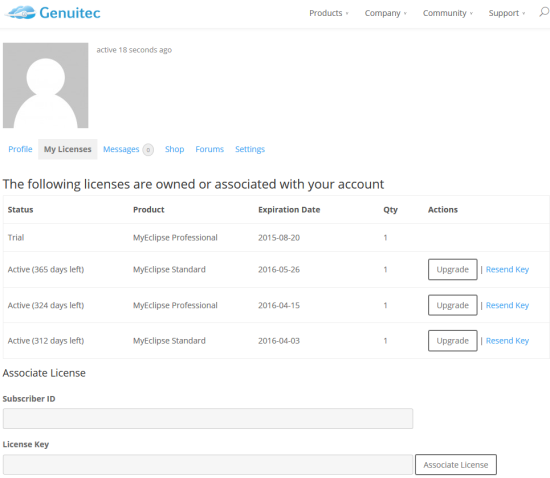 To include another member’s license on your My Licenses list, enter the Subscriber ID and License Key in the Associate License area and click Associate License. The Messages feature in your profile is a convenient way to communicate with other members and staff. View your profile and select Messages. Your Inbox displays. Unread messages are highlighted. Note: Click the Sent tab if you want to filter the list to include only messages sent by you. Click the subject to view a message. Tip: To quickly locate a message, type a description in the Search box and click Search. From the Actions column, you can toggle the status of the message between Read and Unread or click Delete to remove the message from your inbox. Tip: To update the Actions for multiple messages, select the check box for each message, select the action from the Bulk Actions list, and then click Apply. View your profile and select Messages>Compose. Enter the member’s username in the Send To. Enter your message and select Choose file if you would like to attach a file. You can view your order history, purchase MyEclipse products with PayPal or a credit card, and request quotes from your profile. View your profile and select Shop>History. View your profile, select Shop and then click Buy Software Now. Click here for more information. Use our product forums to find answers to your questions, make product suggestions and get in on discussions with other members. From your profile, select Forums to view topics you have started and replied to, view favorite topics and manage your subscriptions. For more information on forums, click here.